Bryson City, North Carolina is a resort town with a small town feel. The city is located in western North Carolina in the foothills of the Appalachian Mountains. This is the home of the Great Smoky Mountain Railroad, but that's not all the town has to offer. White water rafting and kayaking are available in various locations near the town. The town also has charming businesses and restaurants in the down town area. Location: Bryson City is on the western side of North Carolina. It is located just off of the Great Smoky Mountain Expressway/Highway 74. 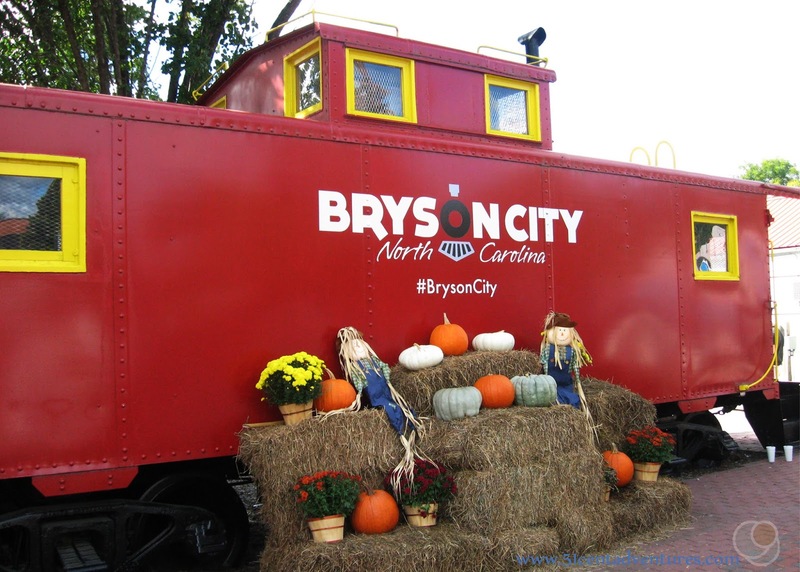 Cost: Visiting the Bryson City is free, however plan to pay for the different attractions throughout town. This was the second stop of the second day of our road trip to Tennessee and Kentucky in the fall of 2016. We'd driven over the Cherohala Skyway that morning and now we were enjoying the beautiful North Carolina scenery. We were driving along Highway 19 when we entered Bryson City. One of my favorite things about going on road trips is when I stumble into something amazing that I'd never known about before. Sure I do a lot of research in advance, but inevitably I always find something new when I'm on the road with my family. 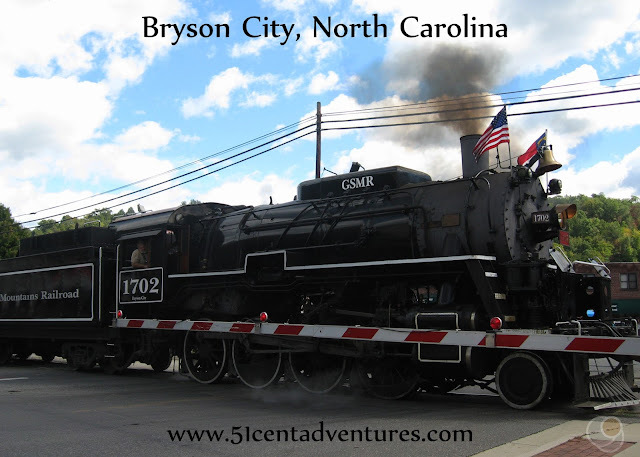 Bryson City in North Carolina was one of those pleasant surprises. Our plan for the afternoon was to circle around the eastern side of the Great Smoky Mountains before crossing back over and reaching our campsite on the western side of the mountains. I'd planned this trip relatively quickly and so I'd never got around to looking up things to do in North Carolina. Honestly, I didn't even plan on making any stops in North Carolina, but then we wandered into Bryson City. This is one of those rare resort towns that has maintained a small town feel. It reminded me a lot of Moab, Utah - if Moab was located in the mountains. So maybe it was a smaller version of Park City, Utah. I saw a sign directing us to a train museum. And since my son loves trains I knew we should go check it out. At first I thought this was going to be a train museum like you can find in just about every small town off every highway in America. I expected to see the usual giant steam train on display outside a historic depot. But when we got closer we saw a giant steam train pulling away from the train yard. This was one of the engines for the Great Smoky Mountain Railroad. This railroad is the heart and sole of Bryson City. 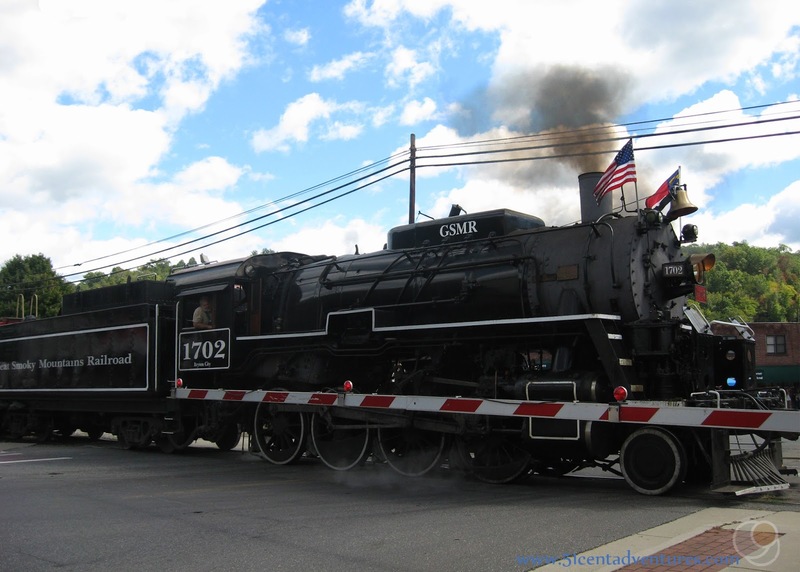 People come from all over to take part in the various excursions that the railroad has to offer. The train rides range from simple sight seeing tours to special holiday themed adventures. One of the most popular events is the Polar Express Train ride offered during December. I hadn't planned on stopping in this town, let alone taking a train ride, so unfortunately we couldn't buy tickets for a train ride. I also suspected that tickets for the 6 of us would be way out of our budget for this road trip. (I was right - the least expensive tickets start at $56 for an adult and $32 for a child. That's far from being a 51 Cent Adventure.) However, we still wanted to see the trains. So we found a place to park and walked back to the tracks We found a cute little toy train outside the ticket office. My daughters played on the train for a long time. They ended up on a promotional video produced by North Carolina Weekend. You can see my daughter poke her head out of the play train at minute 2:52. I didn't know this until I watched this video, but there was a large model train museum near the train tracks. The Smoky Mountain Trains Model Railroad Museum has an operating Lionel Train layout. 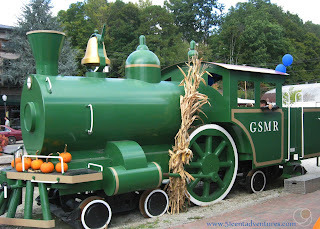 Admission to the museum is included with tickets on the Great Smoky Mountain Railroad. Or you can pay $9 for adults and $5 for children. It's probably good we didn't know about this place while we were here or else my son would never have let us leave. As it was he was pretty mad when we had to walk away from all the big trains. 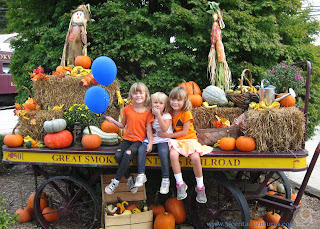 His sisters on the other hand enjoyed posing for pictures. I bet you are wondering where those blue balloons came from? Well we got those almost as soon as we got out of the car. Finding a parking space in Bryson City on a busy Saturday is a bit tricky. Many of the bigger lots require you to pay $5 to park there. We ended up parking in a small parking lot near the Swain County Court House. This is right next to the Tuskegee River. 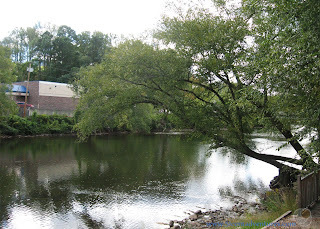 There was a small park named River Front Park with a pavilion on the waters edge. We went over to the pavilion to have a little picnic lunch, and ended up arriving at the very end of a meeting for local members of the Democratic Party. They had blue balloons set up as decorations. Since they were done with the balloons they offered them to my children. The kids were all very happy. As I said we were on the edge of the Tuskegee River which runs through downtown Bryson City. It was a very pretty river with a trail running along the bank. There are many rivers in this part of North Carolina and there are many ways to enjoy the rivers. Fishing, boating, kayaking, and even white water rafting are all options. One of the things I'd noticed first about Bryson City was the picturesque downtown area. We entered the city on Main Street which was also Highway 19, but to get to the Train Depot we had to turn onto Everett Street. This street was so charming. Every building was well maintained and obviously full of history. I liked walking up and down the sidewalk. If my kids were older we may have even gone inside the many businesses. The city had set up little photo spots. This city obviously understands social media. 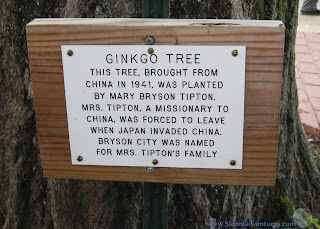 I'm sure we barely scratched the surface of things to see and do in Bryson City. I definitely want to come back here if we are ever in this part of the country again. Here's one final thing that we found on our way back to our car. We passed a tree that was easily 70 or 80 feet tall. 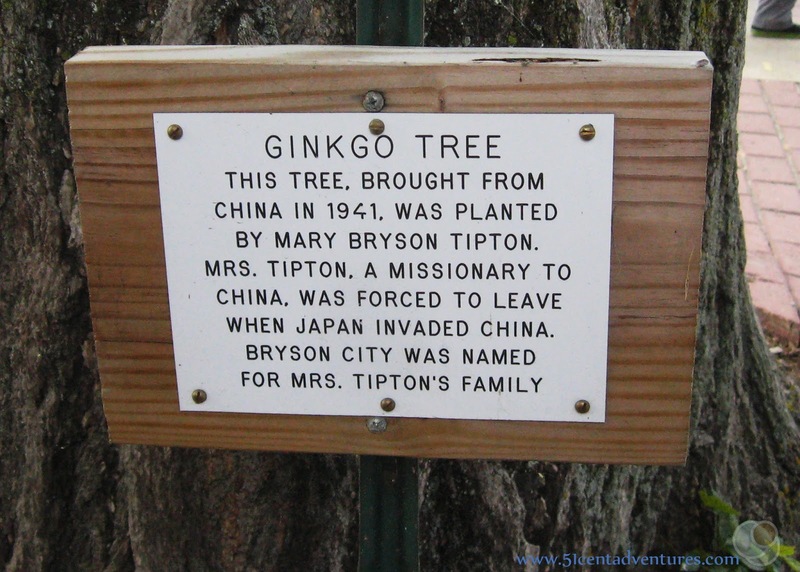 The tree was a ginko tree and it had a sign saying that this tree was brought from China in 1941. This town was full of interesting surprises. Recommendation: Our impromptu visit to Bryson City, North Carolina was great. I'm sure with a little bit of planning this town could be the center of a great vacation. One thing I want to point out is that though this town was crowded, it didn't feel over run with tourists. 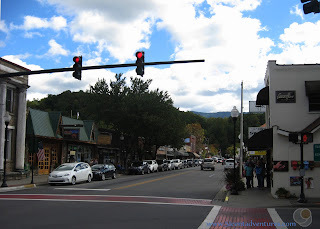 Later in the trip we would go through Gatlinburg, Tennessee which was overflowing with people and cars. That's not how Bryson City was. So if you are looking for a laid back location for a Smoky Mountain vacation you might want to consider checking out this cute little North Carolina town. Directions: Bryson City is about 40 miles southwest of Interstate 40. Places Nearby: The Cherokee Tribe has a reservation just a few miles to the northeast of Bryson City. Cherokee is the name of a nearby city, and is also an interesting tourist destination. In the summer months you can see a critically acclaimed outdoor drama titled, Unto These Hills. Tickets are $20 for an adult and $10 for children. Children five and under are free. Next Stop: Cosby Campground in Great Smoky National Park.